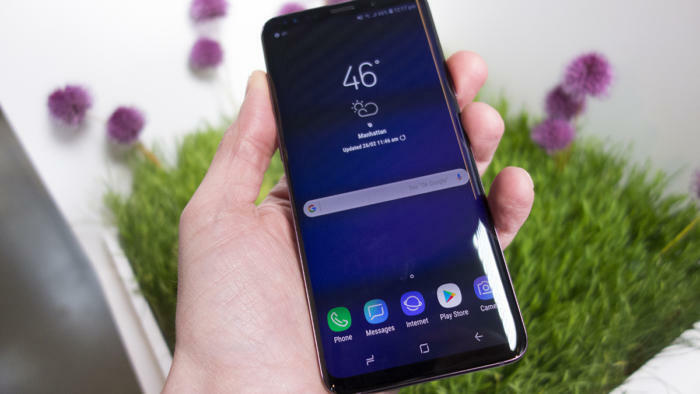 Samsung's Galaxy S9+ is a worthy smartphone to sit at the top of the company's range and comes with a welcome performance boost and new features for enterprise users. Picking up the phone, it becomes clear that Samsung hasn't messed too much with the successful formula of the Galaxy flagships of the past. The phone has the same all-glass front and back with a screen that curves towards the left and right edges and fills up most of the front of the device. 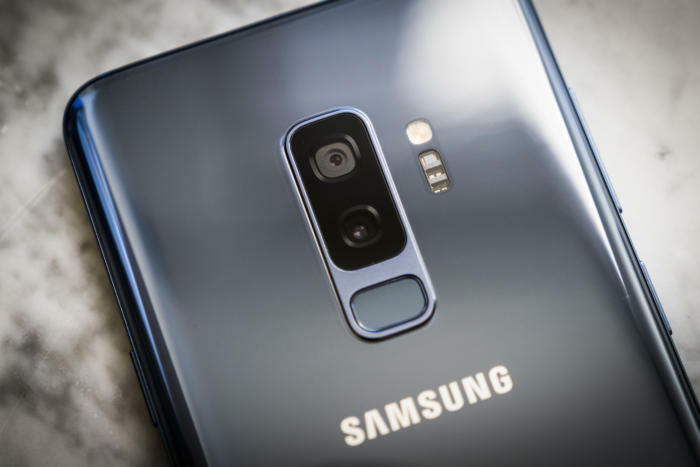 In fact, you many might be hard-pressed to differentiate it from other recent Galaxy phones but there are a couple of clues on the rear: Samsung has brought the dual cameras from the Note 8 -- one has a wide-angle lens and the other a conventional lens -- to the S9+ and, in a bow to Internet complaints, the fingerprint sensor has been moved from the side of the camera to underneath it. Samsung wisely moved its fingerprint sensor to below the camera. Performance is better thanks to the Qualcomm Snapdragon 845 processor. In my tests, the phone zipped along and felt considerably faster than my current Note 8, however a new phone is always going to feel faster than an older device gummed up with apps. Luckily there are benchmarks, and on Geekbench 4, the phone scored 2,225 and 8,449 for single and multicore respectively. That's a healthy jump on the Qualcomm-based S8+, which averaged 1,784 and 6,025 respectively. Some of the biggest upgrades are around the camera, which is based on a new imaging chip that has its own memory so it can quickly store captured images and be ready for another picture. That means it can capture bursts of images in fast succession: at 960 frames per second. When played back at 60 frames per second, you get a super slow-motion effect. It's a neat trick, even if it is one you'll only use occasionally. So too are the AR moji, Samsung's personalized animated graphics that are a lot of fun and one of the key software selling points of the phone. 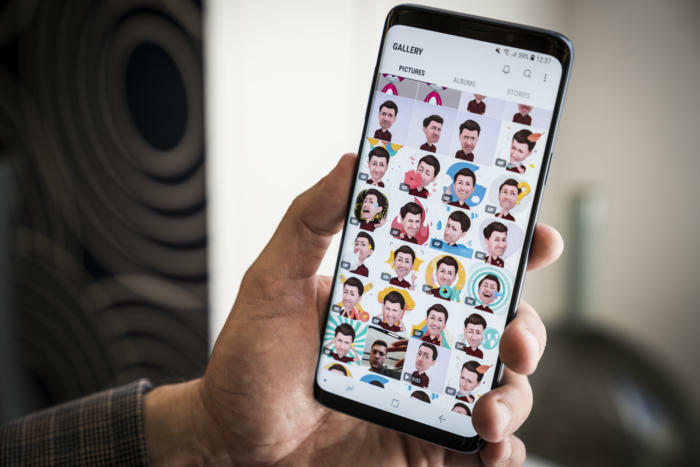 As soon as you save your AR Emoji, a suite of themed animated GIFs appear in your gallery, and are ready to use in messaging apps. In auto mode, the on-sensor memory is also used to capture up to 12 versions of the same image. The phone then picks the best parts from each of those images, stitches them together and comes up with a single image. Pictures shot by the phone were bright, sharp and good looking, as you would expect. I have no complaints about the camera. The screen hasn't changed much on the Galaxy S9. For business users, the phone comes with a host of productivity improvements that should make it a more useful companion. New is the ability to pin pairs of apps to the desktop so they can be opened together. 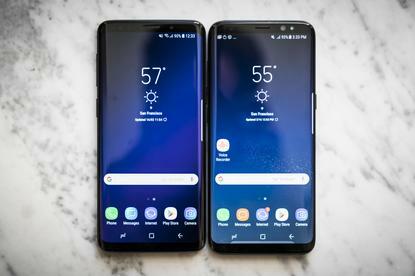 Samsung has offered multitasking on previous phones -- allowing apps to be open side-by-side -- but now favorite combinations can be saved so they both open with a single tap. There's a new biometric login mode called Intelligent Scan that combines iris and facial recognition. In tests, I found it made opening the phone a snap but Samsung says it's not as secure as iris identification on its own. Users can also specify a different fingerprint to access a secure folder than the one used to unlock the phone. The Enterprise Edition of the phone, available from Samsung and channel partners, also comes with Knox Configure that allows remote provisioning and configuration of mobile devices with granular control of many settings. 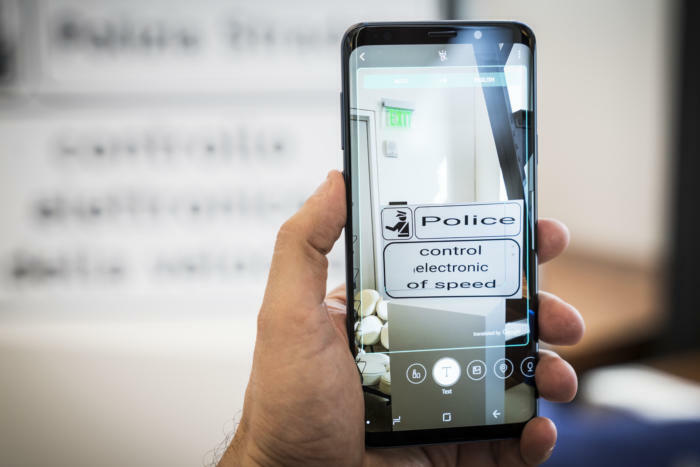 Samsung's Bixby digital assistant has also been updated and can now do live translation with the camera. When pointed at text in a foreign language, the camera attempts to recognize it and translate it. The same feature was already available in Google's Translate app. Bixby can translation foreign languages in real-time. These words were in Spanish just seconds ago. Perhaps the biggest improvement for enterprise users is the one that isn't available yet: a new version of the DeX dock called the DeX Pad. 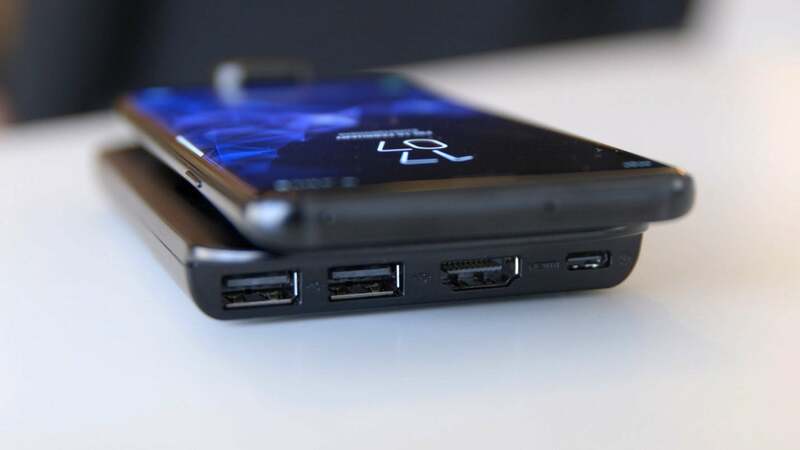 This new DeX positions the phone flat on your desktop, as opposed to standing at an upright angle as in the original dock. With the phone flat, the screen can be used as a trackpad, negating the need for a mouse. Samsung said an on-screen keyboard is also coming, although that would appear to be a little more clumsy to use. With DeX, Samsung is hoping to convince users that they don't necessarily need to take a laptop with them to meetings or on business trips as DeX interfaces with a monitor, keyboard and mouse to produce a computer desktop-style interface. The phone connects to DeX via its USB-C socket. It breaks this out to two USB-A, a USB-C and an HDMI connector. The dock can charge the phone if connected to power but otherwise doesn't require power. Screen-resolution of the desktop interface is also improved. The previous version output a high-definition (1920 x 1080) video image while the new version ups that to 2560 x 1440 pixels, so users have more screen real-estate. We'll have a full review of DeX when it becomes available. The phone launches on March 16. Unlocked versions of the Galaxy S9 will cost from $720 and the S9+ begins at $840.